Gentoo Forums :: View topic - Emoji fonts? Posted: Mon Jul 21, 2014 4:12 am Post subject: Emoji fonts? Hey all...... I am getting tired of seeing the generic Unicode "missing glyph" symbol on facebook every time one of my friends there uses emoji. I'm sure they're only going to get used more and more as time goes on. Are there no emoji font packages in portage? I don't find any on searching "emoji". Thanks. I don't think its simply a question of a font ... this suggests changes to freetype2, cairo, etc, would be required. Also, from what I can gather this particular font is owned by Apple, and "derivatives" are "not permitted". Firefox on windows shows way more glyphs on the emoji list page than on linux. The font on windows is "Segoe UI Symbol", while linux firefox says "Arial" (with my setup). Edit: On my main gentoo installation, the site works. This is due to media-fonts/symbola. Thanks for the responses. I looked at the URL that Apheus posted..... and I have virtually all of them displayed! (only one missing that I can find on a quick, casual scroll-through). I'm kinda drawing a blank here, but maybe I never knew....... how do I find out what font Firefox is using to render a given page? I don't have symbola installed! Freeky, so... in other words, it means nothing to have all those glyphs display for me, because the site is sending its font to my browser, eh? I guess I need to install symbola or the font offered by that site. how do I find out what font Firefox is using to render a given page? Just to add that information: Press Ctrl+Shift+I to open the DOM inspector. In the smaller panel on the right, there are four tabs. One of them is "Fonts". When you activate it, firefox shows the used font(s) in the DOM element under the cursor in the web page. Freeky, so... in other words, it means nothing to have all those glyphs display for me, because the site is sending its font to my browser, eh? I guess I need to install symbola or the font offered by that site. I have no idea about symbola font. media-fonts/unifont has a large amount of emoji glyphs now. It's an ugly bitmap font, but for normal text sizes it looks acceptable. Most of these fonts are available in portage. EDIT: with dejavu, quivira and symbola you will have almost all of the symbols listed on emojisymbols.com - except for U+303D which is some obscure CJK character and U+E50A which is in the private use area. I found a font called emojione-color-font. You can install it from my overlay. Supports also from Twitter, and it's based in Unicode 9.0. Since it's been two years, I'll add media-fonts/symbola and media-fonts/noto to my recommendation above. Between them they cover pretty much all of Unicode. Are there any plans to merge it into main portage tree? I found that Noto Color Emoji rendering is very broken, including gedit and Firefox. Glyphs are way, way too large and the wrong color. in gnome-characters all the fonts are black and white without color. also i think i miss some menus on the left with more emojis. thanks, but there are no changes after i apply this. i also restart my computer. (it closed now because it was solved). maybe i don't have the latest fontconfig/gnome? i have the latest fontconfig. (without the need of local.conf settings). but it is just one change. everything else is black and white and i miss a lot of emoticons in gnome characters as before. are looking different if look there in firefox or chrome. in firefox they are rounded. in chrome they not rounded but more like "Trapezoid"
it seems that chrome and firefox have a different implementations of the emojis. I'm sure they're only going to get used more and more as time goes on. This turned out to be the case and after seeing them used in URLs, I finally decided to do something about it. What a rabbit hole I went down. You can install as many fonts as you want but I will emphasize that what they will do is provide glyph coverage on the off chance that they are selected automatically if they weren't selected manually (i.e. there is a good chance they will do nothing). If a @font-face isn't provided, the system flips a coin (I'm exaggerating) by cascading through fontconfig. Noto has NotoColorEmoji.ttf but no fontconfig files (despite being packaged for several years); you'd need to add something manually for it. A proper fontconfig file is indeed the key. The problem is that said fontconfig file probably won't be applicable for every user. If Noto is your poison, this will work in a pinch but only for Chromium based browsers. It does not work for Firefox but at least it won't clash with it. You can make a more complex fontconfig file to force Firefox to use those fonts but it will display nothing instead of falling back to sane defaults. The reason why is because there are multiple formats for color fonts. Noto was designed for Chromium based browsers and thus uses Google's Android format, CBLC/CBDT. Firefox, on the other hand, uses SVGinOT. Therefore, if you find a font is working on a Chromium based browser but not with Firefox, you need to find a SVGinOT variant of the font (e.g. in the case of Noto Color Emoji, you need to use Noto Color Emoji SVGinOT) or better yet, something with native support. What native support you ask? Firefox comes bundled with a little known font called EmojiOne Mozilla. The problem is that it practically never gets used. So basically to get color emojis, your fontconfig file should force Chromium based browsers to use Noto Color Emoji (or whatever else you prefer) and force Firefox to use EmojiOne Mozilla. If it works, this demo page will have near-complete coverage (note, when testing, you only need to restart the application utilizing the font and not the entire computer). Now making this widespread (e.g. color emojis in terminals and text editors)? That's another story. To retrieve colored emoji glyphs on cairo-dependent packages, you need at least Cairo 1.15.8. 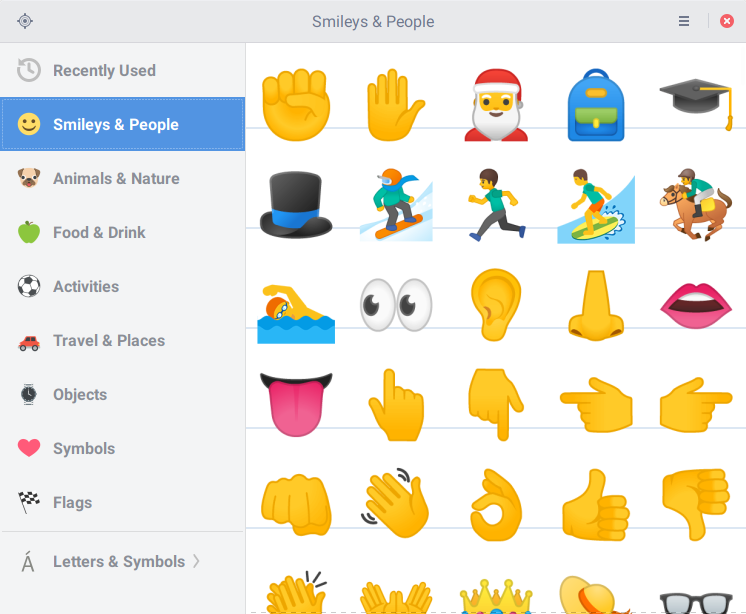 I'm pretty sure GNOME Characters uses Noto Color Emoji. If you have Noto installed then another font is probably being selected after cascading through fontconfig. It will also be different on Android (Android Emoji) Mac (Apple Color Emoji) and Windows (Segoe UI Emoji). Is the solution the same for the square icons that appear? If you have reason to believe that they represent color emojis then the solution discussed here will work. Update (2018-11-29): I made it widespread. I did it by disabling every available fontconfig .conf then setting global font defaults while making sure Noto Color Emoji was the first match for every font type family. There was some program exclusion/inclusion involved as well since not everything liked my changes and I also had to make it compatible with infinality. There was also the nice surprise of some normal symbols being unnecessarily emojified.